The Zojirushi BB-HAC10 breadmaker is a wonderful solution to breadmaking kneads for a small household. It has a 4.5 out of 5 star rating on Amazon at the time of this writing out of 667 reviews. For those with a shortage of kitchen counter real estate the HAC10 has the smallest footprint of any breadmaker we’ve seen. It was ranked at 6th in the 10 best breadmakers of 2015 with accolades of being the smallest. The product description on Amazon boasts that one will, “Enjoy fun recipes such as pizza, bagels, brioche, pretzels, doughnuts and cinnamon rolls.” No doubt fun is to be had, but to embark on a bagel–making adventure leaves one wondering where all the bagel recipes are. Indeed the BB-HAC10 manual itself includes dough recipes for butter rolls, doughnuts, brioches, cinnamon rolls, croissants, and whole wheat buns, but a bagel do’h! recipe is nowhere to be found. 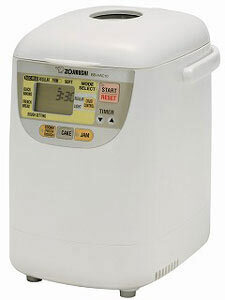 Breadmaking recipes on Zojirushi’s site include a bagel dough recipe, but only for their larger BB-CEC20 and BB-PAC20 breadmaker models. We could not find any bagel dough recipes specific to the BB-HAC10 elsewhere on the interwebs. Our initial attempt to craft a bagel dough for the BB-HAC10 was to proportionally reduce the ingredients based on the recipe for the larger BB-CE20 model. This resulted in a mound of powder early into the kneading phase and the attempt was abandoned. Our next attempt was to use the BB-CE20 recipe as–is. That this recipe called for 3.75 cups of bread flour, while the largest amount a BB-HAC10 recipe called for was 2.25 cups caused some concern of overflow, but after the kneading phase these concerns were unfounded. The little BB-HAC10 had no trouble kneading the dough. At this point it was just a matter of following the recipe to completion. The holes were made too small, and during the phase when the bagels expand to twice their size, came to look more like belly buttons than what a bagel hole should be. In the end, they didn’t really look like bagels, or taste like them. Instead they were more like heavy rolls. But that is ok, they won’t be wasted. I still think with more experience in the steps done after the breadmaker is involved a more true bagel could be made. The end result. More roll than bagel.